I like the look, and I hope it will like the rock. anyways I thought I'd share. It looks nice, and you certainly don't have to worry about it tipping over! I am very curious how it will perform with all that calcium in its environment. Yeah, the calcium/PH thing had me concerned for a while. A friend however mounted a Brassavola Jiminy Cricket on a piece of coral a couple years ago, and told me it has taken off nicely. Then I saw this picture posted by François Sockhom Mey from Koh Kong, Cambodia. 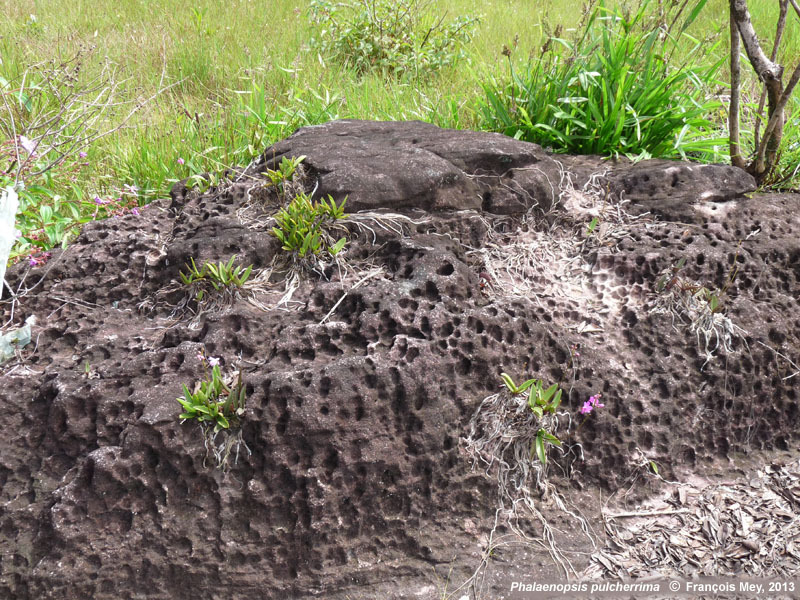 I'm no geologist, nor do I know anything about the geology of Cambodia, but this rock looks very much to me to be a weather worn outcropping of limestone... I of course could be very wrong. But it will be interesting to see how the pulcherrima reacts. "Limestone" is not a uniform thing, globally. It is mostly calcium carbonate, but may also contain other alkaline earth minerals, mostly magnesium and iron. How soluble they are depends upon the mineral content, crystal structure, temperature of the solutions applied and their chemistries. My "gut" tells me that it'll be fine, but I would keep a close eye on it.